Liquid for cleaning natural leather (except from lamb), saffian (also called: Moroccan leather - goat skin, plant-tanned), saddle-related products and furniture with leather finishing. The liquid’s characteristic is high efficiency. 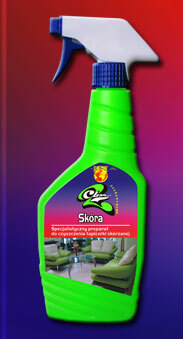 It cleans car interior of most kinds of stains. It also conditions and conserves the leather against staining in the future. It helps leather maintain its elasticity. It regains the natural colour of leather and makes it more water resistant. Perform a test of the leather’s colour resistance prior to using it. It is easy to use. All you need to do is apply a small amount of the liquid onto the surface that you wish to clean and rub it until stains disappear. Then, wipe the cleaned surface with a dry clean cloth.